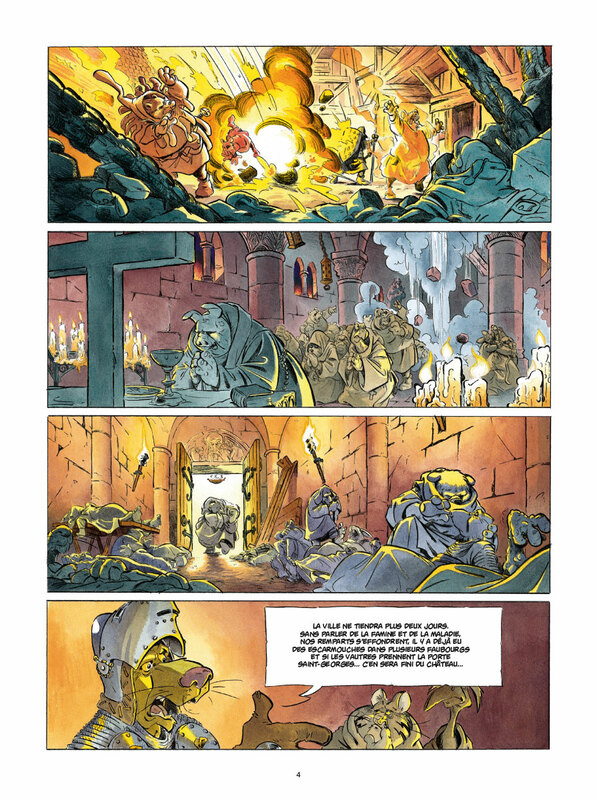 French Anthro Comic: L’Epée d’Ardenois T. 4/4, – Book Review by Fred Patten. L’Épée d’Ardenois. T. 4/4, Nuhy, by Étienne Willem. Geneva, Switzerland, Éditions Paquet, June 2015, hardbound €16,00 (64 pages). This is part of Lex Nakashima’s & my project to bring American furry fans the best of new French-language animalière bandes dessinées. Volumes 1, 2, and 3 of this 4-volume series, which were 48 pages each, were previously reviewed. Here is volume 4, the 64-page conclusion. It’s complicated, and apparently hopeless. If you haven’t started L’Épée d’Ardenois yet, begin it with volume 1, Garen, rather than with this climax & conclusion. Nuhy begins with all appearing lost and goes downhill from there. The 64-page album is about 60 pages of increasing depression, but lots of thrilling medieval warfare and swordplay. Is young Garen – the rabbit equivalent of a 12- or 13-year-old farmboy, really the “boy of the prophecy” who can defeat Nuhy and Hellequin? He can barely lift the legendary Sword of Ardenois; shouldn’t a stronger knight take it from him and fight in his place? Is his determination to become a Companion of the Dawn really their salvation, or a naïve bravado that will lead them to doom? 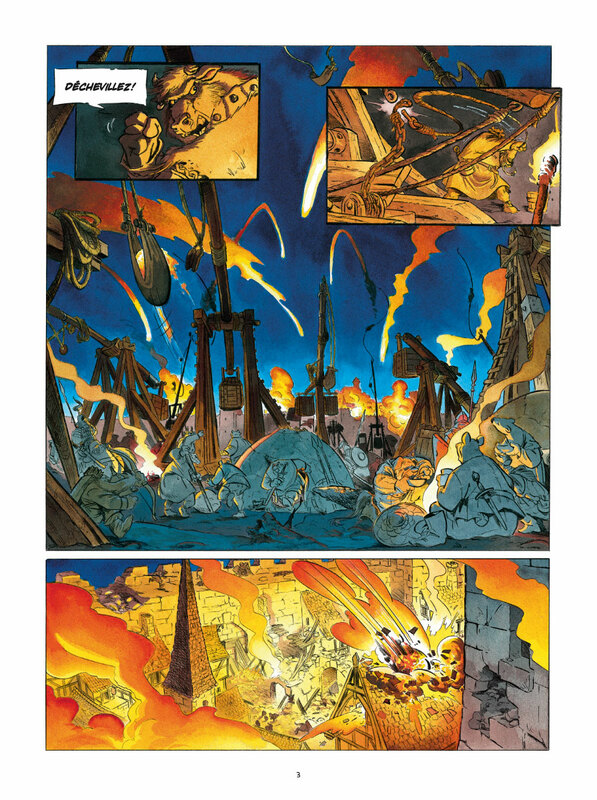 The remaining four pages… well, that would give away what L’Épée d’Ardenois has been all about. This is what medieval warfare and politics were really like (minus the funny animals). Study your Machiavelli. Willem has said in an interview that L’Épée d’Ardenois is his tribute to the medieval Roman de Renard, Disney’s 1973 Robin Hood movie, Jacques’ Redwall novels, and all of the medieval-setting talking-animal fantasies that have influenced him. He has said in another interview that his influences also include the adventure novels of Alexandre Dumas (The Three Musketeers, The Count of Monte Cristo, etc.) and the movies of Sergio Leone. He’s not planning a sequel to L’Épée d’Ardenois (considering how it ends, would any sequel be advisable? ), and he doesn’t think any movie of it would be possible (“assurément non! ); it would have to be too bowdlerized. But he is planning more animalière adventures – he is working on one now set in the skies above New York City in the 1930s, with lots of 1930s aircraft. I want to read it!